There’s something about grief that’s surprised me. It doesn’t go away. I’d always believed in that saying ‘time is a healer’ which, in turn influenced the support I offered grieving friends presuming that after a few months they’d moved on, the busyness of life filling the gaps left by their loss. But I’m here to tell you grief doesn’t leave. Yes, the pain eventually becomes less acute, but the loss remains present. I have friends who’ve lost husbands, children, parents and siblings, who are living out grief in the everyday tasks of work, food shopping, taking the kids to school, cooking dinner and watching telly. From the outside it may look as though they’re coping, that time has healed them. But if you sit them down with a cup of tea and ask how they’re doing, you’ll realise that they still miss the ones they loved and lost, smiling or sad their grief is still present. I think the grief of infertility is pretty complex. It’s not just a story owned by those who’ve conceived and lost, it’s bigger than that. There may never be a specific point of loss, but that doesn’t mean that the grief experienced isn’t as real or painful as the grief felt for someone known personally. This grief is not a new thing. The pain of the childless weeps through the ancient pages of the Bible – the broken heart of the infertile woman laid bare before God through the prayers of Hannah, the laughter of Sarah, the despair of Rachel and the rejoicing of Elizabeth. This grief is not short-lived either, it’s a story people carry with them far beyond their childbearing years. A study of involuntary childless women in Sweden showed that even 20 years after their failed fertility treatment they still think about their childlessness and experience low self-esteem and feelings of social isolation. I’ll just say it plain and simple – the inability to conceive and carry a child never leaves you. 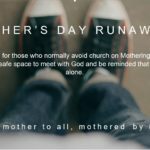 The joy of adoption or step-children, Godchildren, nephews, nieces, puppies, kittens, or cake rarely provide complete healing from the grief of an empty womb. This is not to say that joy cannot come from the beauty of adoption or the privilege of being an Aunt or Uncle, but those experiences cannot replace the grief felt – the two must journey through life together, the bitter and the sweet, the saltwater and the honey. We are surrounded by men and women, young and old who carry with them their own stories of the child who was never born, you may be one of them. It’s a story that is often buried deep, unhealed by the passing of time. It’s a story that’s often too delicate to share but it is one that desperately needs to be heard. It’s a story expressed here by a new voice, the beautifully brave voice of an adoptive mother living with infertility. Recently my mind has been stirred by ghosts of emotions from my past – of echoes that I thought were long gone. 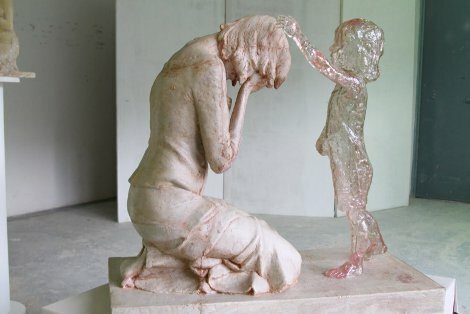 When I saw this artwork, it reminded me of the substance of those echoes – echoes of the grief of infertility, of never feeling a child growing within me, never feeling the pains of childbirth, never having my home filled with children. Don’t get me wrong – I am a mother – to a daughter I dearly love with all my heart. Although adopted, I couldn’t love her more, couldn’t imagine life without her, couldn’t bear not to be her mother. And because she is so precious, because I don’t want her to feel any the less or not enough, I feel guilty for feeling like this and I hide my pain. I feel the echoes of grief of not being able to adopt again, for the large family I’d always imagined I’d have – surrounded by children of different ages, each with their individual characters and personalities, for those busy family events, outings, sharing our lives together. So why do I feel this longing in my soul again, after all this time, after being blessed with motherhood in the marvellously creative way that God does in putting people together to create families beyond partnership? Why am I feeling those bitter/sweet emotions again when I hear that friends, who have struggled with infertility, are now pregnant – so pleased for them, delighting in their joy, but feeling a sharp pain in my heart too. Maybe it’s because I am now passing natural child-bearing age, so the hope of a miracle, that has always hidden in the smallest corner of my soul has begun to finally shrivel and die. A hope so remote I barely knew it existed, but because I believe in miracles, has always found a place to hide within me. A hope against hope, against the knowledge that I have no eggs, no ovaries, no womb even anymore, the knowledge that without a miracle my body has been incapable of conceiving and carrying a baby. So I acknowledge the echoes and allow them to surface, allow the tears to fall and the grief to show its face again. Maybe this time it will be less devastating than before. Maybe this time will be the last time. Or maybe not. I grieve for the child who was never born. I grieve for the children who were never adopted. I grieve for the siblings my daughter will never have and feel the weight of her losses too. But I have hope – I have hope in a God who knows my pain. I have hope in a God who holds me close and who doesn’t tell me to stop crying, but wipes away my tears. So I will look at this picture, at this artwork and I will feel my pain, feel my grief. But I will also be mindful of the pain and grief of others – and will let my tears fall for those who grieve without hope and without the comfort of God, that they might experience his arms holding them close, like the arms of a mother holding her child.